Again, not enough pics, sorry. 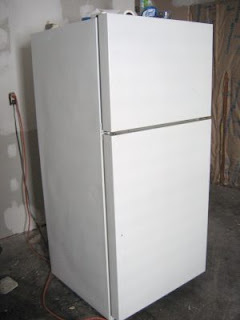 For example, this is my fridge, but I forgot to take one with the handle still on. And I switched the handle from a the left to the right too! Anyway, I read a bunch of info from various sites and I have to say a lot of them make it sound way more complicated than it is. 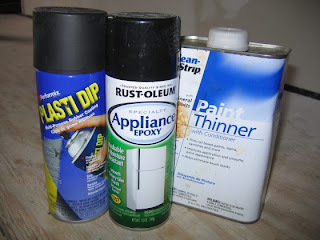 First, I bought four (maybe five) cans of Rust-Oleum Appliance Epoxy in black (it only comes in high gloss, which is what I wanted, so no problem there). I also picked up Plasti Dip, which is this rubberizing spray paint. I'd also recommend both paint thinner and remover. I'll talk more about that later. Wash down the fridge. Scrubbing Bubbles Bathroom Cleaner worked amazingly well! Who knew? I sprayed it on, let it sit, and everything just wiped right off. Then I wiped it down with plain water. Some people recommend a diluted ammonia mix, and all sorts of complicated things like scrubbing every crevice with a toothbrush. Here's the thing, I didn't expect so much over-spray, so I didn't clean off the top. It had all sorts of yuck on there and I wound up spraying right over it without a problem. Now here's a very important tip: make sure you have your windows and doors open, and if possible put up a tarp to block of fumes from other rooms. Equally important: there's going to be a lot more over-spray than you'd expect. Wear a really good mask (I actually had paint inside my nostrils the first round of spraying!) and cover yourself head to toe...I'd go as far as to recommend a ski mask. If you wind up covered in paint because you don't believe it'll be that bad, it's okay, it will come out of your hair...on your head and on your arms...and off the rest of you if you scrub really well with soap and water. Go to the dollar store and grab those scrubby bath mitts, works wonders. Once it's completely dry, remove the handles. Then tape off anything you don't want sprayed. I kept my gaskets, since new ones would have run me almost $200...I know, right? I had no idea they'd be that expensive. 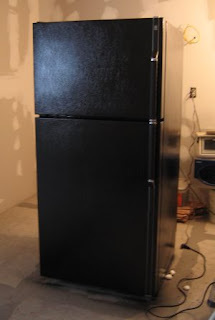 If you're going to keep yours, tape them off too or they get too hard and your fridge probably won't close right. Spray on a light coat. Short strokes, maybe four or five inches tops at a time. Wave your hand back and forth pretty quickly. It'll be splotchy and look weird, but it's okay. The can said to wait at least a half hour, but I sprayed in the morning then waited until the next morning to spray again. Probably overkill, but definitely make sure it's completely dry, not tacky, before spraying again. Repeat the spraying process another three to four times. Always light coats and be on the lookout for spots, bubbles or runny paint. If you notice any, put some paint thinner on a rag and smooth it out. After the last coat dried I lightly rubbed down the whole thing with paint thinner and I really think it helped with the paint looking more even and shiny. Maybe it was all in my head, who knows. Remove the tape from the gaskets and lightly spray them, unless you don't mind the gaskets being a different color. I had a lot of issues painting the inside strip on the door. I think the best way to do that would probably be to unplug and defrost first. I think the cold and condensation screwed it up. I'm going to try going over it with permanent black market. 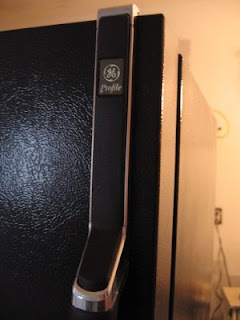 As for the handles, rubber paint does not work like regular paint. You can't tape stuff off then peel, because all the paint comes up. Spraying then immediately taking off the tape is time consuming and also, not so effective. Trying to cut the paint with an exacto knife so it doesn't pull up, doesn't work either. My fellow lazy people, take the handles completely apart! Unless you want to just spray all the chrome areas too, but I thought that would look weird. You also can't tape over the brand name emblem. It's glued on, so just peel it off carefully and stick it back on when it's all over. I may spray on a final coat of clear paint, but I'm not sure. I'll keep you posted on that one. I think it looks really great. Definitely an easy DIY project. And a whole heck of a lot cheaper than buying a new fridge! Glad to see how well you did..I'll be calling you if I ever get that far.